​You want to start bodyweight training? But you can't do pull ups yet? This is exactly where to start! Bodyweight Rows, inverted rows, or just rows, are the 'Level 1' of Pull Exercises. On this page I am going to show you how to do bodyweight rows, start to finish, so you can get training! All you need to do rows is a Dipping Bar, or other similar bar at about hip height. You could use some railings, or hang a Barbell and move the Bench out of the way . . . Or Squat Rack . . . Or Bike Rack. And a Training Partner to encourage you to hit that Rep Count! Bodyweight Rows are Level 1 of Pull Movements. For that reason there arent exactly Pre-Requisite exercises. However there is a little something that you should familiarise yourself with before you dive in head first - Scapula Exercises. Scapula Rows, like all of the Scapula exercises are basically straight arm rows. Instead of bending your arms, pull your shoulders back to pull your body up slightly. Then completely relax your shoulders to lower yourself towards the ground. At first, you probably wont feel like you are moving very much, if at all. That's ok. Scapula exercises are used to increase shoulder stability and range of motion. Getting good at these is essential to bodyweight mastery, so start them now, before it is too late! We are all warmed up let's get into these rows. Don't spread your hands too wide on the bar, about shoulder width is fine. Start by activating your scapula and drawing your shoulders back, just like that scapula row. Pull up to the bar touching it with your chest. Make sure your elbows are pulling back behind you, kept tight into your body not stuck out to the sides. Pause briefly at the top, nice and tight across your whole body. Remember you should always pause at the top/bottom of your rep. Really own it! Lower yourself back down to the starting position. Never drop down, always go slightly slower so you can feel you are resisting gravity and not 'falling'. Finally release your scapula to return to full dead hang. You should try to separate the scapula activation when you first start training with these exercises. Eventually it will be one nice smooth movement, but it is good to train scapula activation separately to drill in the full range of motion. Yes, you can do Wide Grip Rows, but like Push Ups, you want your shoulders and hands in line, with your elbows staying tight to your body. All you need to do is bring your hands in so they are closer together. Your posture throughout your Rows will stay pretty much the same. Keep your core tight to maintain a nice straight shape, you want to avoid sagging or pushing your hips too high. Bodyweight Rows are your starting Pull Exercise. If you can't do pulls yet, these are essential training to work half of your upper body. Pair these up with Push Ups, the Level 1 Push Exercise, and you have a Superset that will build the initial strength to progress to Pulls and Dips. If you can already do Pulls & Dips, put them later in your workout, as finishers or as a lesser set as you begin to fatigue. There are plenty of variations you can try of these, just get creative. I like to do a handful of variations mixed with complex push up variations for a low level, stamina building workout. 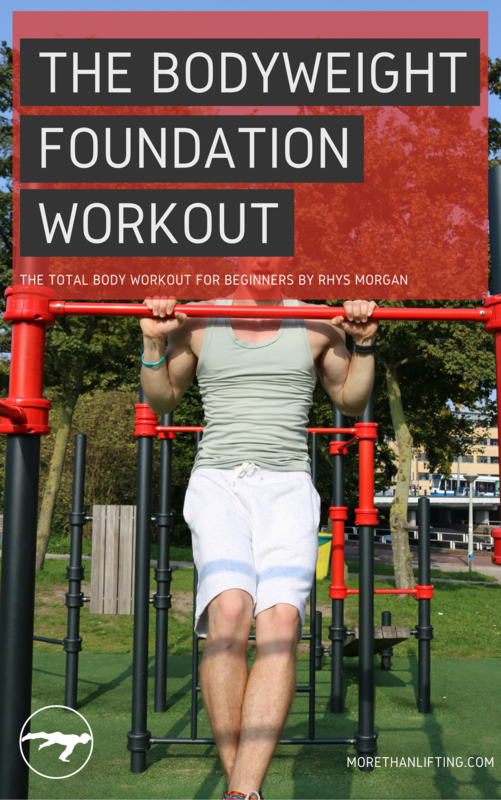 For a real life example you can try Today, just check out the Bodyweight Foundation Workout here. If you are itching to get into advanced training methods and skill development, that's cool, but don't think that you are too good for a 'low-level' exercise such as Rows or Push Ups. There are as many variations of these as there are hand positions, plus a few more. Archer Rows, Typewriter Rows even One Arm Rows! A great exercise to build towards that One Arm Pull Up! They all challenge your body in slightly different ways, so give them all a go, and don't forget to get a bit creative with it. Having said that, get past Rows quickly and use them as a supplementary exercise. Because ultimately you are better off doing Pull Ups, long term.